Bear has been part of the DDG family for as long as we can remember and we couldn’t be happier to feature him as our Dog Day Getaway Dog of the Month November 2018! October 2018 DOTM is our Handsome boy FROST! This amazingly Handsome boy is Frost, he is full of fun, mischief and life. 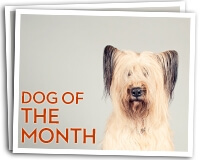 We couldn’t be more excited to have him as our featured dog! Our love of dogs prompted us to build something special in Apple Valley. Our large indoor/outdoor interactive play area will keep your dog and their new friends busy all day making them more social pets!